Today I’m posting the short interview I had with guest post writer and published author Dr. Edward Group. His book The Green Body Cleanse is now available in print and e-book formats from Amazon, and he is the founder of the Global Healing Center. Dr. Group was gracious enough to permit me a few questions about his successful career and the books he has written. Now I’m going to present the questions I asked and his detailed responses for you. I hope you’ll enjoy this brief Q&A and find it as enlightening as I have, and if you’re interested, please feel free to check out his books and company. Can you tell me a little about who you are, your history, and your career background? I hold a variety of degrees related to natural health and healing from many established institutions including a Doctor of Chiropractic (DC) from Texas Chiropractic College, a Naturopathic Physician (ND) degree from the Natural Healing Institute of Naturopathy, an Alternative Medical Practitioner (AMP) certification from the American Alternative Medical Association, and more. I’ve studied natural healing methods for over twenty years and now use that knowledge to educate individuals and practitioners throughout the world. My mission is to help as many people as I can by providing them with the most accurate health information in the world. I want to help educate and heal the world, promote a clean environment, and bring back good health, positive thinking, happiness, and love. You are the CEO of Global Healing Center. What does this company do, and where is it based? I founded Global Healing Center in 1998 with the goal of providing individuals with a variety of resources related to alternative, natural, and organic health. Global Healing Center offers a wide variety of products and home health equipment such as air purifiers, water purifiers, hi-tech supplementation, radiation protectors, books and educational material, colon cleanse supplements, custom designed health programs, personal consulting and more. The company’s goal is to educate people in understanding what causes poor health and to help them achieve their health goals by providing people with the tools that they need to live a long, healthy, happy life. What inspired you the most to write the books that you have? Over my 20 years of research and study, I’ve become disgusted with the mainstream medical community. It seems to me that the health care industry is more focused on treating the disease when its real goal should be to prevent disease. Following extensive research, I realized that our environment is full of toxins, and by living a toxin-free life, we can reach optimal health and happiness. Can you tell me a little about what The Green Body Cleanse book is all about? What is the book’s biggest message to readers? The Green Body Cleanse addresses disease with a different attitude than most health care professionals take: to prevent disease instead of simply treat it. A significant amount of the book focuses on the toxic state of the average person’s colon, and I provide readers with ways to test exactly how toxic his or her colon is. I then go on to discuss the overwhelming amount of toxins that we come into contact with during each and every day. I also supply solutions to the problems with a list of tips at the end of each chapter. Some of these tips are lifestyle-changing, but many of them are easy to implement and are promised to do a world of good. 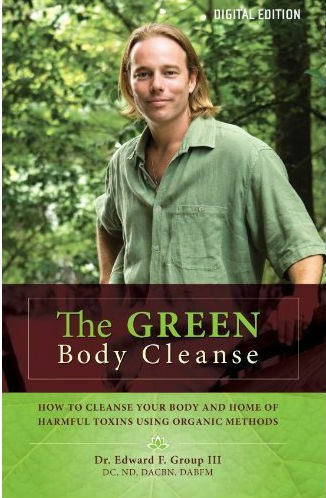 Finally, I give readers a complete plan: the Green Body Cleanse. Who is your target audience for this book, and why do you think it’s important for that particular audience? My target audience with The Green Body Cleanse is every single person in the world. I feel that people are grossly uneducated about the lifestyle choices they make on a daily basis, and many of these choices lead to an unhealthy state. Only through education can a person gain the knowledge they need to eradicate toxic living and lead a fulfilling, healthy life. The Green Body Cleanse can be bought from the official website TheGreenBodyCleanse.com, or you can buy the Amazon Kindle edition for just $2.99. And there you have it! I hope you’ve enjoyed this short interview with Dr. Group, and please feel free to leave any comments you may have! Tomorrow I’ll be starting a new series that you won’t want to miss. In the meantime, I hope you’ve enjoyed this mini-series on e-books and Dr. Group’s particular insight into the process! Hello all – I’ve got a fantastic guest post for you today courtesy of Dr. Edward Group. Dr. Group is the founder of Global Healing Center and has written several books. In his guest post, he’ll be talking about e-books and how he got into the electronic version of books. So, without further ado, here is the guest post by Dr. Group! The journey to getting a book published and having it released to the public is a difficult, but rewarding path. You must think about the message you’re trying to convey, and you must decide if print or electronic is the way to go. When I first began writing The Green Body Cleanse, these worries were the furthest thing from my mind. I was concerned with one thing: telling what I knew in order to help my readers live healthy, toxic-free lives. I was more concerned with portraying the best information and advice to my readers than I was with worrying about if I should push for hardcover, paperback, or electronic book formats. Once the book was published in hardcover in 2009, I sat back and basked in my glory. It was listed on Amazon.com, and I was thrilled that my message was now out there, ready to be received by all those looking to adopt a healthier lifestyle. After a year, it was time to try out an electronic version. After all, it couldn’t hurt matters, right? So The Green Body Cleanse was converted into a version suitable for e-readers such as the Amazon Kindle. I knew that it would take a lot of work to get attention drawn to the Kindle version of my book. By utilizing various forums and tools on the Internet, my team and I did all we could to get the word out that my book was now available in Kindle format. It made sense to first turn to Amazon to promote the e-book—that was where it was being sold, after all. We created an Amazon Listmania list focused on the best natural health books available for the Kindle and also created a So You’d Like To… guide on Amazon focused on natural cleansing. We got the word out on a number of e-book and Kindle forums, and then targeted sites that featured author interviews. The promotion never seemed to stop—but it was all worth it. The result of all of our hard work? The Kindle version of The Green Body Cleanse went to the #1 spot on the Amazon Kindle Natural Health bestseller list! My book is just one true-life study of how you can make e-books work for you! Dr. Edward F. Group III has authored several books including The Green Body Cleanse and Health Begins in the Colon. He is also the creator of the revolutionary Oxy-Powder colon cleansing program. Technically speaking I am among the throngs of the unemployed. It’s not a bad situation for me as it is for thousands of others; I’m still living at home with my parents, and they both have steady (or fairly steady) jobs to keep us fed and clothed. I’m pretty blessed in the fact that they’re not raring to throw me out onto the streets or finding ways to not-so-subtly encourage me to get any job I can find. That’s not to say I’m not looking; I am. I’m just not sure how excited I am about getting a job in the first place. When I was younger, I imagined writers that I adored sitting back with their families, writing at leisure, sending off manuscripts to editors and publishers and whatnot, and being lazy in the meantime. It sounded like a great life to me. Get paid to write? And have lots of free time on the side? Who wouldn’t want to do that? Unfortunately, as all childhood dreams are wont to do, I wised up. Perhaps I don’t have all the facts, but I’m fairly certain most of the writers out there are not sleeping in, writing a few hours a day, and then making lavish dinners using the expensive ingredients they’re able to buy on their author’s income. To my knowledge it’s a little more common for writers, especially those who are unestablished, to work a second job until they make enough money writing that they don’t need a supplementary income. Or, in the case of a lot of female writers I’ve seen, they’ll write all day while their husbands work. Even in that situation, I can’t see it being the leisurely art I often dreamed of. And the husband either has a very good job or the family lives modestly. I get the feeling that’s a more practical way of looking at things. I’m not published, at least, not in terms of novels. I’ve barely finished writing my first one. And I’m afraid it needs months of work to get it into a presentable stage that could be used to query agents or publishers. No, I’m nowhere near being a published author. But I always wanted to be one. And now I’m wondering how long my parents would consent to letting me be a stay-at-home author while unpublished and with no form of supplementary income. I’m guessing that won’t last long if I’m not at least looking for a job. Sometimes I think it’s too bad I don’t already have a rich husband willing to let me stay home and write all day. But then again I probably wouldn’t have written my first novel had I already been married. A lot of things would be different. And I imagine a lot of authors have had the same thoughts. How would things have changed for some of our favorite authors if they hadn’t had the experiences they did? For one thing, we wouldn’t have nearly as exciting of books to read. The whole ‘write what you know’ admonishment does tend to stick, after all. For another, some of the great authors might never have begun writing had they not experienced certain things. I think that would be a great travesty, personally. To have the ability to put into words something that is precious and beautiful and yet never to use it? It’s like Bach having never composed. And what would the world be like without ‘Toccata and Fuge in D Minor’? Certainly we wouldn’t know what we’d missed, but would there be a part of us that yearned for something greater than ourselves? It’s possible. Even so, it is, as I’ve read in various Q&As with authors, a good thing to have jobs and husbands (or wives) on the side of writing. While writing can be a passion, writing in and of itself is almost never the message. Even in the dry spells, there’s something to be drawn out, molded, shaped into something brighter, and then kneaded like dough. There’s a message to give if one just knows what to look for. As much as I hate to admit it, my own state of unemployment even has its own story to tell. The only question is how to wend my way through the detritus to find the gold gems beneath. Two days ago I visited one of my favorite author’s websites. I was browsing through parts of it since I haven’t really been around it lately, and I came across the “contact info” page with the traditional email form that people can use to get in touch with her. Now I’ve never done this before, but I have a friend who has. She actually emails her favorite author back and forth fairly often, and she reads everything the woman writes. As I thought about that, I figured, why not email her and see what happens? Yesterday I woke up and was fairly busy during the morning, so I couldn’t check my email. When I finally got the chance to yesterday afternoon, I was so surprised to see an email from Lauren Willig in my inbox. I noticed it was sent the day before at 10ish p.m., so I wasn’t sure what to think. But I opened it and read the email and was pleasantly surprised to be hearing from Lauren herself! 😀 I am ashamed to admit I didn’t expect to hear back from her since I assumed she would be too busy to get back to me. It’s lovely, really, to hear from one of your favorite authors. I wanted to write because your series has been one of the best I’ve read in ages. What’s more, you based it off my all-time favorite book The Scarlet Pimpernel. Most people I know have never even heard of the poor Pimpernel, which is a very sad state of affairs. I watched the 1934 version of the movie in middle school and fell in love with the swashbuckling Sir Percy. I read the book in high school and was even more in love. And then when browsing my bookstore a few years back, I was confronted with a sight I never expected to see. The title The Secret History of the Pink Carnation caught my attention immediately. My first thought was, “This reminds me of ‘The Scarlet Pimpernel!’ I wonder what it’s about.” I plucked it off the shelf and was very quickly carrying it to the checkout counter. I’ve bought every book since and have quite simply fallen in love with your characters. Thank you so much for your lovely email! It’s always wonderful to hear from a fellow devotee of that demmed, elusive Pimpernel. And, yes, it is a very sad state of affairs when so many people seem not to know of him! I’m always fascinated, when I describe my books to folks as being in the tradition of The Scarlet Pimpernel, to see who nods and who says, “Huh?” Sadly, there are a great many “huhs”. Isn’t that cool? I thought it was pretty awesome myself! Now I’m wondering if it’s considered poor etiquette to reply to her email or not. I’d like to because I have quite a few questions for her, but of course, I don’t want to clog up her inbox with my own thoughts and comments. Has anyone else done something similar? I’d love to hear about it.